As of tomorrow morning I will be managing the Holmethorpe Sand Pits blog and keeping it updated. It was originally set up and hosted by Graham James, the Pits patch birder extraordinaire, who lives in Merstham. Graham is one of the vital group of birders in Britain who keep a very detailed record of the birds that are seen on his local patch, but due to a situation out of his control, he felt it was time to hand over the reins. Without this dedication most birders wouldn't get to see half the species they do, particularly now with Twitter, pagers and the like keeping everyone updated by the minute. So, it is a privilege to be given the responsibility to look after the blog (see side panel for link) – and to be part of the British birding scene at the coal face. Holmethorpe is developing into a cracking birding area. It has a bit of everything - waders, ducks, geese, raptors, rails, owls, finches. Oh, and plenty of gulls. Currently, the patch is going through a purple patch with Smew, Scaup, Goldeneye and Curlew currently featuring, while on a brief visit to Mercers Lake this afternoon I'm 99.9 per cent certain I saw an Iceland Gull (104) with some Herring, Lesser black-backed and Black-headed Gulls. It stood out a mile amongst all the other gulls. It was all white and it had a black tip to its bill. This was another situation where I was just about to take a photo, when a helicopter flew over instigating a mass take-off of all the birds on the lake. 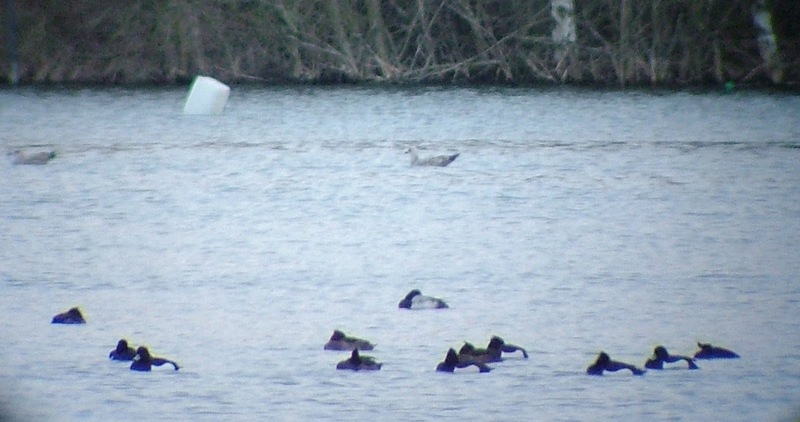 I follow the Iceland Gull for as long as I could, but lost sight of it and couldn't relocate it. Pretty sure it was one, though. I'd gone to the lake to find the Scaup, which I did successfully. It was sleeping in amongst some Tufted Ducks. Also swimming around were four redhead Smew. I'll be patch birding more often this year - it's more satisfying than dipping Tundra Bean Geese like I did at the weekend. Talking of the Goose, it looks as if it has moved on to another area not far from Thorpe. It was seen roosting at the Queen Mary Reservoir late this afternoon with some Greylags and White-fronted Geese. It will be interesting to see if it ventures further south. We get a lot of geese down on the Pits, and also in the fields along Rocky Lane - a road that links the A23 with Gatton Bottom. I'll be keeping an eye on these flocks just in case the odd scarcity decides to hang out with them. Many thanks, Neil, for taking over the running of the Holmethorpe blog and enabling it to continue and it's good to know that it is in safe hands.